Coming home from uni is always a great experience for me, a perfect way to recharge my batteries in a sea of deadlines and lectures, but it is even better when you’re coming home for something special. Recently I took myself, and a close friend, to the Nicki Wrld tour stop off at the Manchester arena. The tour takes its name from Minaj and up and coming singer Juice WRLD, who co-headline the tour, and supports Minaj’s critically acclaimed 4th album ‘Queen’. As a big fan of rap in general I was excited to see the show and as a long-time fan of Nicki I was intrigued to see how the persona displayed in her music translated onto the stage. The arena was, as it always is, a hive of energy (and overpriced refreshments) with the shared camaraderie that everyone there is in for a good time ahead. Having a brief peruse of the available merch, the standard tees, hoodies and posters were available, following the same format as every other arena gig I’ve been to for other similarly large billed musicians – nothing extremely pertinent or special in sight. This doesn’t leave a strike against Nicki though, sometimes a standard tee to let everyone know you’ve seen Nicki Minaj is just the right fit for tour merch. Being a veteran of arena tours I had an idea of what to expect, but my friend had never been to a concert before and the excitement she felt only serves to amplify my own. I went into Nicki Minaj’s show with a few ideas of what I was about to watch, one of my ideas being a sub-par opening act. From past experiences of the depressingly monotonous work of Salva (who opened for Shakira’s El Dorado tour) and the complete insufferability of Lady Starlight (who opened for Lady Gaga’s Artpop Ball tour). I was pleasantly surprised by the enjoyability of Juice WRLD who, despite being billed as a headliner, essentially opened the show. 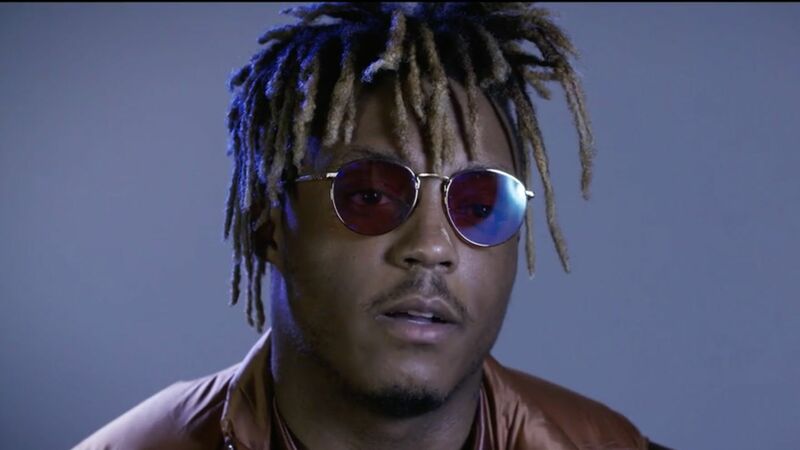 Juice WRLD sang a collection of his most well-known songs, including ‘Wasted’ which was by far the most engaging and well delivered track on his set list. As someone who doesn’t necessarily know Juice WRLD’s work extensively I would now be much more inclined to add at least a few of his songs to my regular rotation of tracks that build up my rap playlist. Then came the moment we had been waiting for, after about two hours of opening acts and a growing sense of anticipation, Nicki emerges from behind a large opening screen. Dressed in an Egyptian inspired gold outfit, Nicki rides a large animatronic pegasus into the centre of the stage. The show opened with an eruptive rendition of ‘Majesty’ which was met with a tsunami of cheers from the packed arena. This shifted seamlessly into the next song, ‘Hard White’ also from the ‘Queen’ album. It is only then that when the crowd is at a fever pitch that Nicki begins to address the audience. Her personality, as a no nonsense woman and as a true professional at her craft came across well on stage. One of the best aspects of the show was her stage presence for sure, cementing Nicki’s well-established status as a real star in her industry. This first portion of the concert was by far one of the best, opening with strong songs from her new album before transitioning in to verses from ‘Feeling Myself’, which originally features Beyoncé, and ‘Only’ which is widely regarded as one of Nicki’s most impactful tracks. We then moved into the next stage of the show which saw Minaj display more of an experimental style of performing by switching up verses from different songs very quickly, ultimately blue-balling the audience when fan favourites such as ‘Roman’s Revenge’ were speedily visited before moving on. It was at this point to that Minaj invited smaller artists to the stage such as Ms Banks to perform a song or two as she chilled further back on the stage. I did enjoy these other artists but at this point in the gig I’m all in for a Nicki show, and would have preferred this segment to spend more time on giving some of the songs performed by Minaj herself more time to be shown off and less time on giving us a smorgasbord of verses but not much time to enjoy any one of them. With this being said, it wasn’t that this portion of the show wasn’t enjoyable, it just wasn’t what I was hungry for from a Nicki Minaj show. We then came to the brief interval of the show and by this point the audience was fully invested in Nicki’s stage presence and her ability to perfectly deliver some of her most technically challenging flows with astonishing ease. As the second act of the show beings we’re treated to a consecutive performance of Minaj’s most upbeat tracks such as ‘Turn Me On’, ‘Pound the Alarm’ and ‘Starships’ back to back. At this point in the concert I’d be shocked if a single person in the audience remained in their seats. Minaj then, like a true professional, shifts into a section of the concert which showcases her more subdued songs in her repertoire such as ‘All Things Go’. She gave an emotional tribute to the Manchester arena terrorist attack victims following this which, as a proud Mancunian, felt heartfelt and respectful without sounding too preachy. The concert ended with a run through of more of Nicki’s biggest tracks such as ‘Chun Li’ and ‘The Night is Still Young’ before giving an amazing rendition of ‘Super Bass’ for her encore. The lights then turned on in the arena and that was that, the show had ended. This concert out did my expectations by far, proving why Nicki has been the female rapper in the game for ten years now. Her stage presence, costumes, and production all served to aid in the showcasing of true talent and star power. All in all, I would highly recommend anyone who enjoys a good show to come to one of Minaj’s concerts. One of my main criticisms was simply that I would have liked a bit more representation of her latest album on the show’s set list, but beyond this the show was truly a great experience, and for my friend who had never been to a concert before, it was a great introduction to the world of arena tours. Previous articleMaggie Rogers in Concert!